Debate: Should We Avoid Eating Anything With A Face? A doctor, a vegan, a researcher and a farmer recently waded into a hot-button topic in the food world: Is it a bad idea to eat meat? 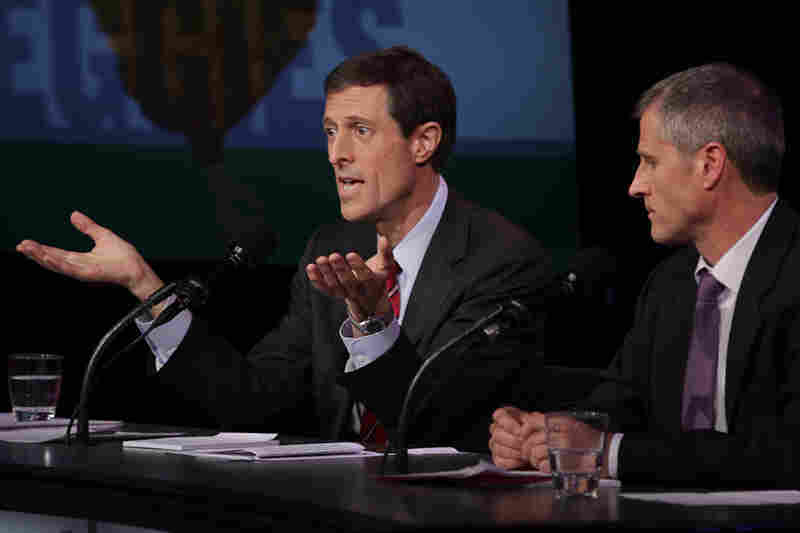 They delve into the medical, ethical and environmental arguments in the latest Intelligence Squared U.S.
Dr. Neal Barnard, Gene Baur, Chris Masterjohn and Joel Salatin debate eating meat for Intelligence Squared with moderator John Donvan. A doctor, a vegan, a researcher and a farmer recently waded into a hot-button topic in the food world: Is it a bad idea to eat meat? 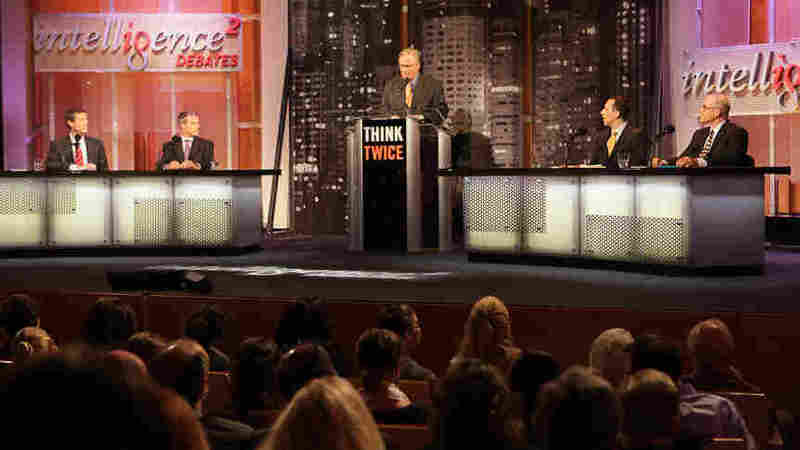 They faced off two against two on the topic for the Intelligence Squared U.S. series. In an Oxford-style debate, they delved into the medical, ethical and environmental arguments surrounding the motion "Don't Eat Anything With A Face." Before the debate, the audience at New York's Kaufman Music Center voted 24 percent in favor of the motion and 51 percent against, with 25 percent undecided. After the debate, 45 percent agreed with the motion, while 43 percent disagreed — making the team arguing against eating meat the winners of the debate. Dr. Neal Barnard and Gene Baur argue in favor of the motion "Don't Eat Anything With A Face." Neal Barnard, M.D., is adjunct associate professor of medicine at the George Washington University School of Medicine in Washington, D.C. He guides numerous clinical trials investigating the effects of diet on body weight, chronic pain and diabetes. Barnard's most recent study of dietary interventions in Type 2 diabetes was funded by the National Institutes of Health. He has authored dozens of scientific publications, 15 books for lay readers, and has hosted three PBS television programs on nutrition and health, ranging from weight loss to Alzheimer's prevention. As president and founder of the nonprofit Physicians Committee for Responsible Medicine, Barnard has worked on efforts to overhaul federal dietary guidelines. He also leads programs advocating for preventive medicine, good nutrition and higher ethical standards in research. Gene Baur, president and co-founder of Farm Sanctuary, has been called "the conscience of the food movement" by Time magazine. Since the mid-1980s, Baur has campaigned to raise awareness of what he sees as the abuses of industrialized factory farming and a system of cheap food production. His book, Farm Sanctuary: Changing Hearts and Minds About Animals and Food (2008), a national bestseller, investigates the ethical questions surrounding beef, poultry, pork, milk and egg production. Chris Masterjohn is a nutritional sciences researcher who is currently examining the physiological interactions between fat-soluble vitamins A, D and K at the University of Illinois at Urbana-Champaign. He has published six peer-reviewed publications and has submitted one manuscript for review. He also writes two blogs: The Daily Lipid and Mother Nature Obeyed, which is hosted by the Weston A. Price Foundation. Joel Salatin is a full-time farmer in Virginia's Shenandoah Valley. A third-generation alternative farmer, he returned to the farm full-time in 1982 and continued refining and adding to his parents' ideas. The farm serves more than 5,000 families, 10 retail outlets and 50 restaurants, through on-farm sales and metropolitan buying clubs. Salatin has written for magazines such as Stockman Grass Farmer, Acres USA and Foodshed. He is the author of eight books, including Folks, This Ain't Normal: A Farmer's Advice for Happier Hens, Healthier People, and a Better World (2012). The family's farm, Polyface Inc., was featured in the new New York Times bestseller The Omnivore's Dilemma, by food writer Michael Pollan, and in the award-winning documentary film Food Inc.